Aqualine Water Tanks is a specialist supplier for both domestic and industrial customers. Our modular products are high-quality, meeting the exacting industry standards demanded by our clients and the uses for which they require our large water tanks. We don’t simply sell and supply water tanks; our expert team will deliver and erect your tank at no extra cost, anywhere in New South Wales, Victoria and Queensland. 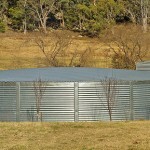 Our galvanised steel tanks are manufactured from Australian BlueScope .9mm thick galvanised steel. The superior metal recommended by BlueScope for water tank construction. BlueScope won’t recommend Zincalume steel for water tank walls because it has the potential to corrode in a moist environment. While Zincalume steel has demonstrated superior performance to galvanised steel in normal atmospheric conditions such as for roofing or shed walling – this is not the case for water tank walls where moisture can form between the steel wall and the polymere lining accelerating corrosion. This is why we only supply products constructed from the highest quality galvanised steel. We have many years of experience and our expert knowledge ensures that you are receiving the very best water tank money can buy. Aqualine uses galvanised steel because it is known to be more resistant to corrosion than Zincalume in this environment. It is also the iconic Australian building material that has stood the test of time and has become part of our heritage. A famous icon dotted across the regional, landscape, from Sydney to Darwin, Perth to Adelaide, Melbourne to Brisbane, and everywhere in between, nothing looks more authentically Australian in the country landscape than a galvanised tank! For more information about our range of products do not hesitate to get in touch with us today. We will be happy to discuss your requirements and help to make an informed purchase. We have many years of experience in the industry, which gives us the expertise to provide honest, genuine advice about our range and the suitability of each product. Pick up the phone and call us on 1300 653 585 to speak with our helpful and friendly staff. You can also leave your details in our contact form and we will get back to you as soon as we can.